Addressing Batch ‘B’ corps members at the NYSC orientation camp in Tsafe, Zamfara State,Olawunmi said the next batch of the corps members would no longer go back to their respective institutions to collect their call up letters, adding that all they needed to do was to open the NYSC portal to do their registration, and then download their call up letters. “Every corps member does not have to go to his or her polytechnic or university to collect their call up letters, he or she can do online registration from anywhere in the world and our portal will be ready by today (Friday). According to him, the scheme was committed to ensuring full digitalisation of its operations, in order to compete with international standard. On the forthcoming 2015 elections, the NYSC boss said that the corps members would be fully involved in the process, warning, however, that they should abide by the rules governing the conduct of the elections. He warned that any corps members found collecting money from politician would be sanctioned. Earlier, the state coordinator of the scheme, Mrs Ruth Bakka disclosed that 1,740 corps members were in the orientation camp. The Management of NYSC wishes to inform the general public and Nigerian graduates (both foreign and locally trained) in particular, that with effect from 2014 Batch ‘C’ mobilisation exercise, mobilisation processes will be online. All Prospective Corps Members are required to register online at the NYSC portal, www.nysc.org.ng or portal.nysc.gov.ng or go to www.nysc.gov.ng to link the portal. Please note that information on accredited registration centres nationwide is available on the home page www.nysc.org.ng. 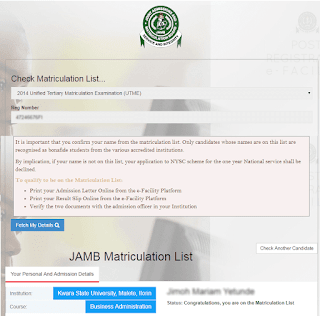 All graduates from Nigerian Universities, Polytechnics/Monotechnics and those affiliated to them (whether full-time or part-time) are expected to carry out their biometric-enabled online registration using their Matriculation Numbers and JAMB Registration Numbers. Also, those for Revalidation (i.e. prospective corps members who were mobilized earlier but for one reason or the other could not report for the orientation course) must equally register online. Thousand Naira (₦4,000.00) using any Bank’s Automated Teller Machine (ATM) Cards or the PIN Vending option from any bank in Nigeria. The feature allows them to print and reprint their call-up letters online in case of loss of call-up letters and also facilitates accelerated camp processing at the Orientation camps. However, those who wish to collect their call-up letters from their Institution need not pay the Four Thousand Naira (₦4,000.00) after the online registration. Meanwhile, members of the public should know that with effect from 2015 Batch ‘A’ all prospective Corps members have to print their Call-up letters online. The online registration for NYSC 2014 Batch ‘C’ service will commence on the 20th August 2014 and end on 12th October 2014.